BREAKAWAY DAILY: Can you tell us a bit about yourself and your background? KEN UNGERECHT: I was born and raised on a small dairy farm in northern Minnesota. I attended college there and taught science for a number of years before moving to Baltimore, Maryland. I spent about forty years there working primarily as an engineer in the field of electronic communications. Along the way I discovered that my true passion was a desire to learn as much as I could about the spiritual aspect of who it is we really are. I retired in 2014 to return home to help my brother keep the family going for a while, play as much golf as I possibly could, and continue pursuing that true passion of discovery. A part of that has been to promote my book and work on trying to put together another one. BD: How would you describe your book? KU: I would describe my book as an open search for spiritual truth and understanding. I think of it as primarily being a science book, but it does go beyond that. It uses science to identify two important principles of spiritual truth. It then examines several ideas that go beyond those principles with an examination of further evidence from science, philosophy, religion, and metaphysics that is relevant to our spiritual heritage. BD: Why did you want to write about universal and spiritual truth, the theories of life’s existence? KU: I wanted to explore universal and spiritual truth because of the intense interest I have in the subject. If a spiritual aspect is a part of the human existence, then it is the most fundamental one there is. Everything that we see, everything that we are must precipitate from it. I am convinced there is such an aspect and that, if we could come to a greater understanding of it, we would be able to use it much more efficiently and wisely than we do. It was to offer my perspective on the subject in the hopes that it might help in that achievement that I have written my book. BD: Writing a book about understanding the universe must have been a daunting task, especially for your first book. How long did it take to write? KU: Writing the book took a little more than a year of back and forth communication with my publisher. BD: This book covers a lot of ground. You delve into the much-debated issues of conception, the afterlife and reincarnation, plus a discussion on the mysterious subject of consciousness, and how it relates to our individual perception of reality. What kind of research did you do to prepare to write this book? KU: The subject of our spirituality has been an interest of mine for more than forty years. I have read a lot of books and attended a lot of seminars related to it. I cannot express the gratitude I feel for all of the information and ideas that I have received from so many people from all of these endeavors. BD: What other theories are you interested in? KU: I am primarily a scientist. I am interested in all things where science can lead us to greater understanding. That includes our spirituality, explorations of the universe, theoretical physics, advances in health care, and what we can do to enhance our own physical, mental, emotional, and spiritual health. I am fascinated by such things as our increasing understanding of the apparent health benefits of medical marijuana and stem cell research, and where that understanding may be leading us. BD: Have you always been interested in these type of topics? KU: Everybody’s life evolves. As a kid, sports was my entire life, both as a participant and a fan. As you grow, other things begin to take on greater interest. Not all of the things that interest me now have always had that effect. BD: What do you hope to get across through your book? KU: I would hope to help stimulate a more open and honest conversation involving our spiritual nature and heritage. We need to come to a greater comprehension of and appreciation for the incredible beings we truly are. We would never be doing many of the things we do if we did have that knowledge and understanding. BD: Do you hope that this book will inspire others to look deeper at their surroundings and the universe? KU: That would be my hope, yes. I think the human race is ready for that. We have a lot of problems in our world. We could use a little help in solving them. I think there are sources outside our physical universe who are ready and eager to offer that assistance, but we are the ones who need to learn how to allow and receive that support. BD: What other books and/or films do you recommend people read to discover more about these various topics? KU: There are countless sources for information around the aspect of our spiritual heritage. Some of the ones that I would highly recommend include the various Seth books by Jane Roberts and the audio and video presentations by Lazaris that are available through Concept Synergy. I would also recommend doing a search on YouTube for any videos available from Bashar and Graham Hancock. I would also recommend the works of Ian Stevenson including the books Twenty Cases Suggestive of Reincarnation and Children Who Remember Previous Lives. BD: Do you believe in things like law of attraction, karma, that people can control their own universe in some way, even though it often feels like we can’t? KU: Yes, I do believe in all of those things. I do think, however, that karma is also essentially a choice and that, at some point, we can rise above any influence it might contain. BD: Do you have anything else you would like to add? KU: Jesus is quoted as having said that if you seek the truth then you can find it and doing so will set you free. I think he was right about that. It is also apparent, based on what several of our more public persons have been doing, that trying to suppress and deny the truth can often take away your freedom. Truth is defined as that which is in accordance with reality. It can sometimes be a hard thing to determine. But, we often make it harder than it should be for various reasons. One of those is by trying to make partial truths the complete and total truth. Building a wall around our country would, at least in the short term, probably increase border security. But, that is a partial truth because it would do nothing to address the fundamental reasons for why we might need that security. Those are primarily sourced amidst the throes of the socio/economic conditions that lead to why people would want to threaten that security. Until we seriously begin to address the political and other factors which produce the imbalance of resources available to people in their efforts to secure happy and fun-filled lives, building walls around countries will never have the kind of positive effect that might be desired from such an effort. Absolute truths, on the other hand, are complete within themselves and they are true for everybody whether they believe them or not. For many reasons, I believe that the concept of reincarnation is an example of such a truth. And, if it is, then it doesn’t make any difference if someone believes it or not. It is just as true for the believer as the non-believer. It is important that we learn to recognize partial truths and that we give them the room they need to grow and mix with other partial truths so that we can use them as stepping stones to greater ones. But, it is equally important that we learn to recognize and seek out absolute truths so that we can use them as a base for constructing useful and happy lives. I believe that perhaps the greatest of these is the idea that the inherent worth of every single human being is exactly the same. It is not something that can be added to or subtracted from. It is a gift from God that cannot be taken away. It is independent of race, creed, sexual orientation, or anything else. It is not a function of anything we have ever done or will ever do. It is an idea that is central to every religion and virtually every other source of spiritual teaching. How many places in the Bible, for example, do we see some variation of the expression that all are equal in the eyes of God? The popular greeting from the Hindu religion of ‘Namaste’ is simply a way of saying that the Divine in me recognizes and acknowledges the Divine in you. But, that is not yet an idea that is generally accepted. If it was, we would never do some of the things we do to each other and we would not be building walls to separate ourselves from each other. It is equally important, however, to recognize that the expressed worth of human beings is not the same. That Divine Spark shines more brightly in some than it does in others. Some people have more fun. Some do more to help themselves and others. Some people craft beautiful lives and others sort of hack out existences. We are all somewhere on that continuum trying to find our way. But, it is also important to remember that perhaps our greatest responsibility is to seek to achieve greater expressions of that Divine Spark in ourselves and to help bring it out in others. That can sometimes be a bit of a challenge. That, no doubt, is one of the things that makes life the beautiful and amazing thing that it is. And, we do need to remember that we live in an imperfect world. There is the light and there is the dark. There is right and there is wrong. There is truth and there is that which is not. And as long as there are those who choose the dark and the wrong and not to seek truth, we will need to take actions that we would prefer not to have to. But, as long as we view punishment as a form of revenge rather than as an effort to bring out the light, we will continue to feel the need to build walls and carry guns and impose sanctions and all of the other things we do in the fruitless effort to make this a less imperfect world. That can only happen as we come to recognize the truth of that Divine Spark that lives somewhere inside each of us. 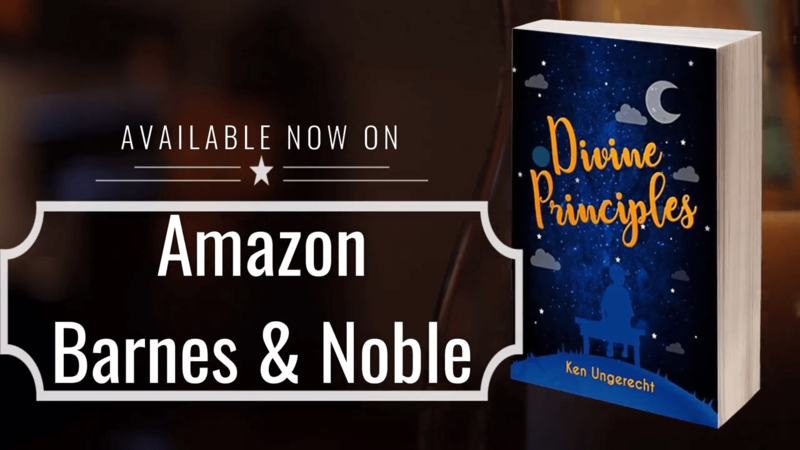 Divine Principles is available via Amazon.